"Concerning the history of kolam, Gift Siromoney has pointed out that the earliest references to kolam drawing in Tamil literary works occur in Madurai Meenakshiammai Kuram (16th Century), and, later, in Thiru Kutraala Kuravanji (17th Century). These references include a description of the manner of preparation of the surface before constructing the kolam patterns. Siromoney notes that "there is no reference to kolam in Tamil word-lists called Nigandus, in earlier Tamil literature, in ancient paintings, or in travellers' accounts. The formal mathematical properties of kolam parrerns have been investigated in pioneering studies by Siromoney and his colleagues at the Madras Christian College (MCC). Formal language theory has been successfully applied to the study of these folk art patterns. Classes of kolam patterns (1 , 2) can be considered as sentences of 2-dimensional picture languages with formally definable syntactic rules. Making use of the underlying syntax rules, computer programs for mechanical generation of kolam patterns belonging to particular languages had also been devised. A complex kolam pattern forms a 'figure' over a 'ground' made up of a grid of dots. These dots called pul@l@is in Tamil clearly serve as props or aids facilitating the learning as well as the reproduction process. Learning, memorizing and reproducing are easier for kolam patterns that can be parsed readily, i.e., that can be decomposed into their constituent units. That pul@l@i in practice act as aids by forming a skeletal framework for kolam practitioners, and that skilled kolam practitioners, in fact, remember the patterns in terms of their parsed constituent units, was demonstrated by Gift Siromoney in a series of elegant experiments. A prerequisite to such a demonstration is our ability to take snapshots of stages in the reproduction process as the kolam practitioner draws a given kolam pattern. Siromoney devised an ingenious, but simple and inexpensive technique to accomplish this. Siromoney's snapshot technique works as follows. Stack, say, 7 sheets of paper and interleave them with black carbon paper. Use a red ballpoint pen for drawing the kolam pattern. The subject starts the kolam drawing on the top sheet. At the end of the first stage (or, after a predetermined time interval), remove the top sheet and the carbon underneath it. 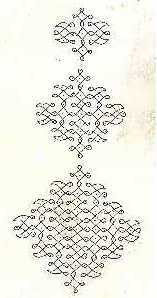 The subject continues to draw the kolam pattern on the second sheet which is now the top sheet. At the end of the second stage, the current top sheet together with its carbon is removed. This process is continued through all the seven stages. Clearly, each sheet (after the completion of the kolam drawing) will contain all parts drawn during the previous stages in black (due to carbon papers) and the part added in the current stage in red. In a series of experiments, skilled kolam practitioners were tested by Siromoney by asking them to draw pre-identified kolam patterns from memory. Their drawing strategies were recorded using the snapshot technique described above. It was found that the practitioners invariably drew the pul@l@is first to define the grid. The kolam patterns were constructed over the grid stage by stage in a manner conforming to the natural segment ability of the pattern. Gift Siromoney was always interested in knowing how the womenfolk remember the complicated kolam patterns. In the month of Margazhi early in the morning he would set out on his motorbike to observe women in action he was intrigued by the remarkable ease with which women drew these patterns. He conducted experimental studies and found to his great interest that they draw it in almost the same way as done by using turtle moves such as go forward, turn left, make a loop and so on. He extended it to kolam moves to capture non-angular kolam patterns. -T. Robinson. Department of Mathematics, MCC. R. Narasimhan, The oral-literate dimension in Indian culture, Indological Essays, Commemorative Volume II for Gift Siromoney, ed. Michael Lockwood, Madras Christian College,1992, pp. 67-79. Marcia Ascher, The kolam Tradition, American Scientist, Vol.90, January-February 2002, pp.56-61. Rani Siromoney, K.G.Subramanian, V.R.Dare, Circular DNA and Splicing Systems, Proc.of ICPIA, Lecture Notes in Computer Science, 654, Springer-Verlag, 1992, pp 260-273. STAT- 62/ 86, March 1986.